I was born in Tegucigalpa, Honduras while my parents were fleeing Nicaragua and coming to the United States. I had lasik eye surgery when I was 21...by the time I was 25 I was wearing glasses again. Lame. I have lived in Miami, FL, Raleigh, NC, and Denver, CO.
My favorite color is always changing. I think right now it's teal. I have a hard time liking new music. It takes me a while to warm up to it. So, no, I probably haven't heard of that new band or that new song from that old band. Sorry, hipsters and music snobs. I love watching movies and tv shows. Looove it. I find it annoying when people brag about never watching tv. I like tv and I don't care who knows it. There you go. Seven random things. Thanks again for the award, Michelle. 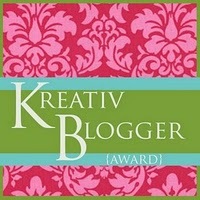 I would like to pass this award to some of the most creative ladies I know: Steph and Tammie.